Despite the weather being quite miserable there was a healthy attendance of seventeen walkers for this long walk from Monyash lead by Nick Wild. From the village, a brisk pace was set to warm us up as we headed north over countless slippery limestone stiles via Hard Rake. This area is owned by the National Park Authority and consists of a number of fields with flower rich grasslands. During the summer the fields are noted for ox-eye daisy, knapweed, hay rattle and meadow vetchling. The enclosed track called Wheal Lane was followed to the southern edge of Taddington and here a sheltered spot was found for our morning break. To reach Chelmorton, our walk continued up over Sough Top, but now we were facing into a cold head wind. Entering the village we passed the historic village church which dates from the 11th century. The village which lies at around 300 metres above sea level is sheltered from the north by Chelmorton Low. Heading along the village street and passing the historic Townend Farm, the group once more continued on field paths over to Sterndale Moor and once over the A515 stopped for a short lunch break. It was a bleak, cold and very windy walk along the ridge skirting above the massive quarries at Hindlow and Dowlow. With drizzle in the air and cloud brushing the hills to the west, it was nice to get to lower ground. In more favourable weather conditions the group continued along the track called Hutmoor Butts, and later turned right into Cross Lane, another track to reach Monyash. Everyone attended the tea room in the village to warm up after the walk. No photographs were taken on the walk so I have included this one of Chelmorton which I took some years ago. 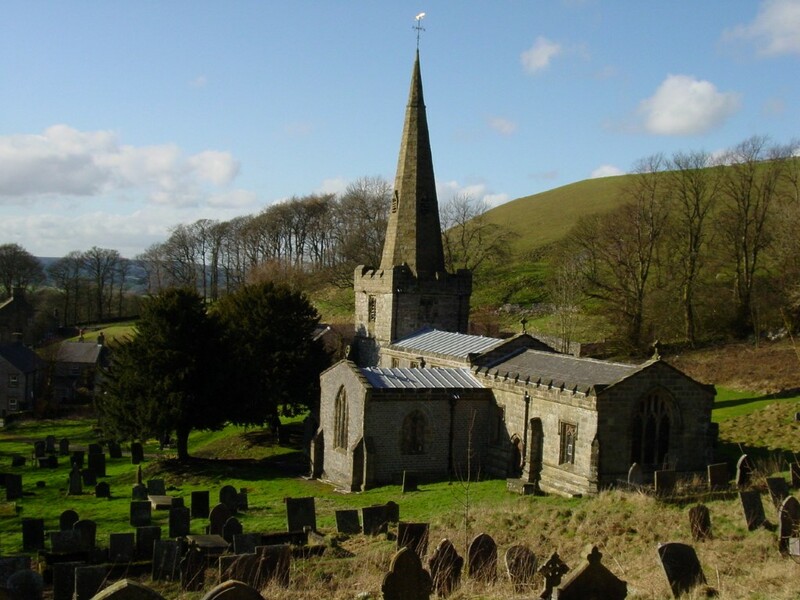 St John the Baptist Church at Chelmorton was passed on our walk but this picture was taken on a sunny winter day. This entry was posted in News by Colin Park. Bookmark the permalink.